Pull-ups require you to call on some significant strength from your body in order to perform a successful rep. Not only do you need a strong back and biceps to get your face up to that bar, but you need to have a strong grip as well. Having a good grip necessitates having strong forearm, wrist, hand and finger muscles. If your fingers ache, you may want to work on your grip strength. 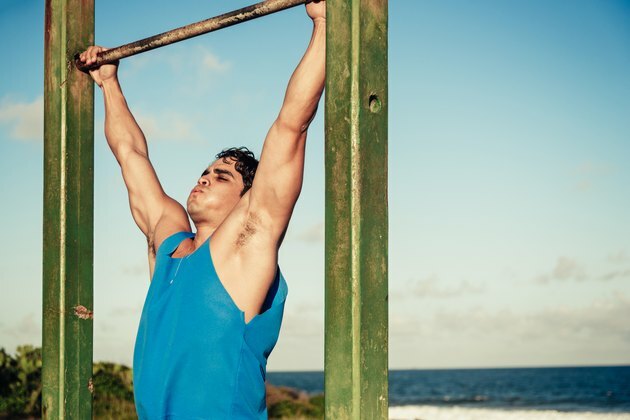 If your fingers ache when performing pull-ups, you may need to increase your grip strength. Poor grip strength prevents you from having a strong and secure grip during exercise sets. If your grip strength is weak, your body's resistance will put too much weight onto your hands and fingers, straining them. You can increase your grip strength in a variety of ways. The American College of Sports Medicine reports that performing exercises such as deadlifts, hammer curls and wrist curls can all make your grip stronger. You can also use equipment, such as hand grip dynamometers, rubber webbing or balls, such as tennis balls, that you can squeeze to strengthen your grip. Multiple correct pull-up grips exist that allow your hand and finger placements to differentiate from one another on the bars. You can change your hand and finger placement to do neutral grip pull-ups or alternated grip pull-ups. The National Strength and Conditioning Association acknowledges that these grips create a firmer hold on the resistance, in this case your body weight, and incorporates more muscle groups into the exercise. The incorporation of more muscle groups puts less strain on your fingers, hands and forearms. You can use neutral grip pull-ups if you have a pull-up station with multiple grips, which position your palms facing each other, or you can use an alternate grip if you have only a straight pull-up bar. An alternate grip has you place one hand's palm around the bar facing toward you and the other hand's palm around the bar facing away from you. You should also examine what type of bar you are using when performing pull-ups. The makeup or style of the bar has a lot to do with your grip. Some bars are slick, requiring a very secure grip from your hands and fingers, while some bars are rough and can cut up your hands and fingers. Using lifting chalk on your hands can help secure your grip on slicker bars while using lifting gloves can help with rougher pull-up bars. Your grip can suffer when you have sweaty palms, which can force you to readjust your grip constantly or put a heavier strain on your fingers while trying to hang on. Fixing this problem involves a few solutions. You can wear lifting gloves so that the fabric absorbs your sweat, you can use lifting chalk to absorb the sweat or you can wrap small towels around the areas of the bar which you grip. What Is the Difference Between a Straight Bar & Curl Bar? What Are the Pros & Cons of Putting Chalk on Hands When Lifting Weights?